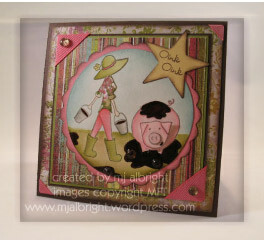 I made this card for MFT’s sketch challenge # 13 over at SCS. 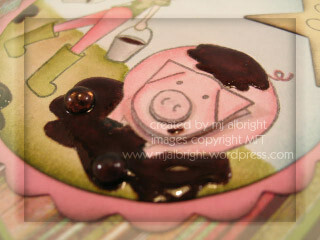 Never thought I’d make a card with a pig in mud, but I think it is darling. I used MFT stamp set Punny Farm for this card. I stamped the images on Shimmery White CS and used an Aqua-Painter for coloring. The pigs head was restamped two additional times and I cut out each element…attached head to body with Stampin’ Dimensional and nose with a Mini Glue-Dot. The mud was colored with a Chocolate Chip Stampin’ Write Marker and I added Crystal Effects and a couple Cowboy Dew Drops. I used my Coluzzle and 3/16″ Corner Rounder Punch to create the large scalloped circle. Large Star Punch used for sentiment (I moved this from the original sketch layout because of where the pig is placed). Regal Rose 5/8″ and 1/4″(retired) ribbon to the corners with Water Dew Drops to two of the ribboned corners. Patterned papers used are BasicGreys Perhaps-Beatrice & Stella Ruby-Ladies Book Club. Card base is Chocolate Chip CS measuring 5″ x 10″ folded in half. I can’t believe I’m making a card today. I have my CPR renewal class on Thursday. Which means I have two days to read the book. I actually like attending this re-certification class way better than ACLS (adv. cardiac life support). With kids and a swimming pool, the information is good to have. So, no more posts until Friday am. Gorgeous! I love the “mud bubbles”…so cute! This is so adorable! I love how you used the dew drops on this card, so clever! This is to stinkin’ cute….love it!!! Oh my word! Mary Jo this is SOOO adorable! I love your little pig with the mud on his cheek! So sweet! way cute card! the dew drops in the mud are such a clever idea! the colors are so bright and fun, too! Love the bauble mud clods!! Great attention to detail!! Well, aren’t you clever! I’m always impressed with your creations. LOVE the mud!!! The little “beads” were the perfect addition – they look just like bubbles! Love it! Oh wow, this is so cool!! I love all the details and the mud is so cool!